The condo was very clean and had a great pool. The beautiful beach was easily accessible. My family had a wonderful time. Only problems were with coded door locking and unlocking.. elevator not working in one building. Overall wonderful stay and loved this condo! Beautifully decorated and very comfortable. Bathrooms nice size too. 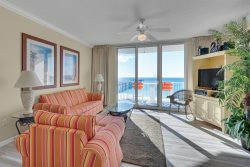 I would highly recommend navarre properties to anyone looking for a relaxing vacation by the ocean. I will stay again, that says it all. This place is really nice. We love the location. Everyone was amazing and kind. Easy to talk to and had nice smiles which is always welcoming! Will be back next year if not before! The team was very polite, kind, and helpful. All questions before our trip were answered promptly and in a friendly manner. The only minor problem was that a few of the dishes, glasses/mugs, silverware pieces, knives, and parts of the blender were dirty upon our arrival. If you are looking for the perfect place to stay at the beach Summerwind Resort is it. Great room and accommodations. Will definitely be staying again! This was a lovely condo much larger than anticipated. The view is amazing. Would definitely stay here again. Our condo was beautiful. It was perfect for my family of 4. The view of the beach, ocean, and pier were amazing.